Last year, I shared a review of Personal-Planner.com's planners and this year I'm sharing their Wall Planner. I'll show you some photos of how I've used mine so far, and at the end of this post, there's a giveaway so that one of you can win a planner! Here's a look at the Wall Planner I'm using. You can choose from a variety of available covers or upload your own. Since I knew that I wouldn't really be looking at my cover if it was hanging on the wall, I just chose one of the available covers, rather than spending time creating a custom one (which is what I did with the planner I ordered last year). Below is a look at the front cover (on the left) and the inside of the wall planner (on the right). You can customize these a lot! I chose the number of columns that I wanted as well as the colours for each column and the background colour (at the top). You can title your tabs (at the top of the columns) if you want to, but I left mine blank so that I could play around with different approaches to planning this way. I can use one column for each person (which is what I was originally going to do- and you can even upload a photo of the person whose column it is & have it printed that way), but I thought that might not actually be the most efficient way to schedule our family's activities since not all of us have very many individual events scheduled regularly. The first week I used my wall planner, I used one column for family plans (since it's summer time, and there's a lot of that going on), one column for me (for meetings and events that I had scheduled that were just for me to attend), and one column for blog posts, so that I could keep track of my blog schedule for the week. I didn't need the 4th column this time. I can see this changing a lot when the girls are back in school and I'm organizing most of the day around what I need to do. 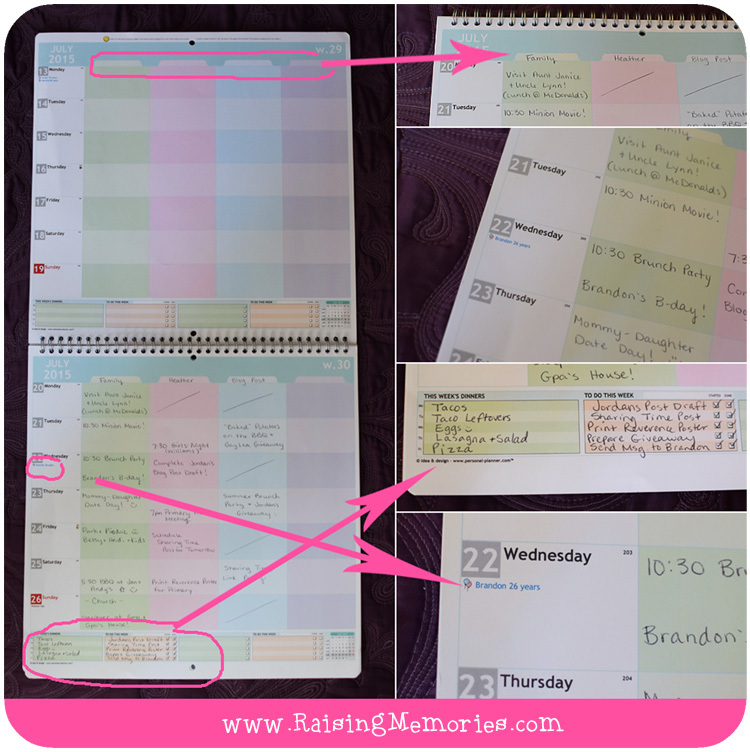 I still had all of our family birthdays and special events listed on the website from the last time I made a planner with this website, so all it took was one click of the mouse, to have birth dates printed right on the planner! At the bottom of each page, you can choose from some different modules. I like to make to-do lists and checklists, so I put three To Do lists at the bottom, and one Dinner planning list on mine. They come automatically with a small month calendar in the bottom right corner, to help you visualize the month's dates. I'm excited to use this especially in the Fall when I'm spending more time blogging and trying to make my days as productive as possible while my kids are busy at school. The plan is to keep that part of my day organized, so that when they're home, I'm free to spend that time with them as much as possible! 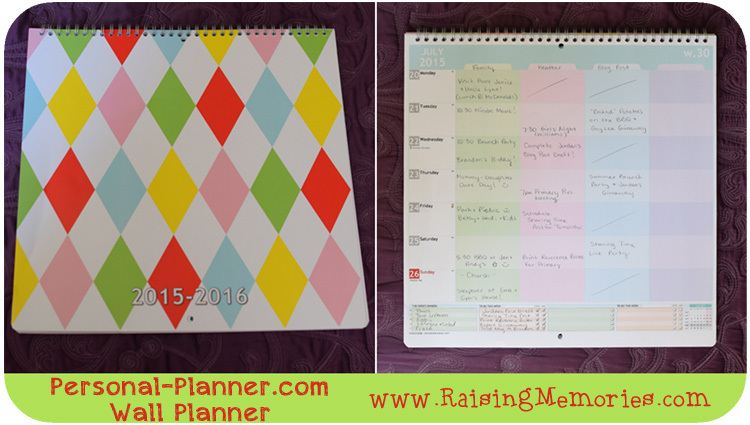 The fabulous people at Personal-Planner.com want to give one of you a free planner! To enter the giveaway, just fill in the form below! This giveaway is open worldwide! Disclosure: I received a planner for review purposes. I would love someone to organize a large storage closet I have. And purge!! Love all the custom options! Most definitely our workshop. It's insane. I would LOVE someone to organize my stockpile. I love it like a second child but ughhh it's a disaster! I would love to have someone help me clean out all the clutter in my closet, and it would be great to have a support coach for my Healthy lifestyle!! I am working super hard to get my blog organized, but some days I wish someone else would do it for me! I need help (or motivation) most definitely in meal planning! Laundry and clothing are the biggest challenges for me (at least this month!). Meal planning needs to be more organized. I feel like we are eating the same meals every week. I really need help organizing all my paperwork/desk area! It's a disaster! i need help organizing the closets! and maybe the kids rooms!